That’s the approach DePaul WorkGuide Vocational Counselor Ed Diaz takes when working to match individuals living with psychiatric and developmental disorders and physical disabilities with jobs. Diaz was honored with the 2015 Cecilia Coulter Award by the Rochester Area Employment Network (RAEN) in March. He has been with WorkGuide for fifteen years. “Ed has worked overnights, weekend and holidays to coach individuals and ensure they have the support they need to be as successful as possible in their job placement,” said WorkGuide Director Chris Tolhurst. As someone who is bilingual, Diaz has been able to work with Hispanic individuals with disabilities to help them find employment. One of his greatest strengths is to support individuals transitioning into a new workplace, said WorkGuide Assistant Director Fiona Osier. “To know that someone can depend on WorkGuide to help them see that there are better days coming ahead and to help them shine, that makes my day,” said Diaz. 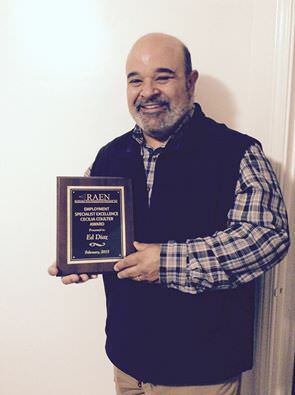 DePaul WorkGuide Employment Specialist Ed Diaz was honored with the 2015 Cecilia Coulter Award by the Rochester Area Employment Network (RAEN) in March. Diaz has been DePaul’s member representative for RAEN and the Job Development Network (JDN) over the course of his employment. “Ed works well with consumers, family members, coworkers, providers and employers and he is well respected and trusted by all of these groups, which leads to his overall career success,” said Senior Vocational Counselor Darcy Smythe. Congratulations!!!!!!!!!!!!!!!!! I am not surprised and it is well earned.